There’s something about Bryan Hitch’s approach to the Justice League that you have to respect. He gets that they are so powerful they need to face threats that have insurmountable odds that also bend the hell out of reality. This latest story arc does just that, but is it good? The first issue in this arc set up a cool time travel storyline. It also set in motion stakes that are so damn high the entire DC Universe is in peril. Add in this issue’s ties to Superman #18 and you have a comic very worthy of your attention. Hitch begins to reveal why the heroes have been stranded at different timelines and the reason is quite interesting. It ties well into each of the hero’s powers, but also into Earth’s history. This issue allows the heroes to get their bearings and start to do something about the impending threat. Speaking of the impending threat, damn does it look glorious in this issue. I’m not quite sure what the full page splash at the end of the issue is exactly, but Fernando Pasarin uses so much detail capturing its size and scope you’ll be blown away. Brad Anderson’s colors do quite a lot to make it feel evil and almost alive. The thing itself is explained as well as any time traveling enemy could be and I think Hitch does a decent job setting up its grandeur. That’s again, due to the art, which Hitch gets out of the way from in the last few pages so that we may see it slowly move over our heroes across time. It’s got an Independence Day vibe in that it’s a giant threat and it’s unclear what the enemy’s intentions are. Each of the heroes get a moment to shine in this one, though Cyborg’s is the briefest, which is a nice reminder of where they are and what they need to do next. Superman and Batman get the most page time as they attempt to reason out what it is they’re facing. Hitch ties the events of Superman #18 well, though be warned you should read Superman first. There’s a lot of talking in the middle part of this issue as Superman seeks answers from the Infinity Corporation Building staff. Some minor clues are dropped in regards to their ambiguous purpose and where they come from, but this scene drags on and doesn’t impart much. There’s also a blip of a character moment between Batman and Superman that’s eye-rolling in its delivery (Superman ribs Batman for not figuring out a time travel connection that’s painfully obvious). The time travel jargon and nonsense of it all is starting to creep in and make the reading experience more frustrating than interesting. A mysterious woman who has been aiding the heroes appears again, and once again there are no answers. Add this to the previous gripe and this issue appears to be withholding any information at all to increase interest, but all it’s really doing is driving the reader a bit bonkers. Jesus had nothing on them. 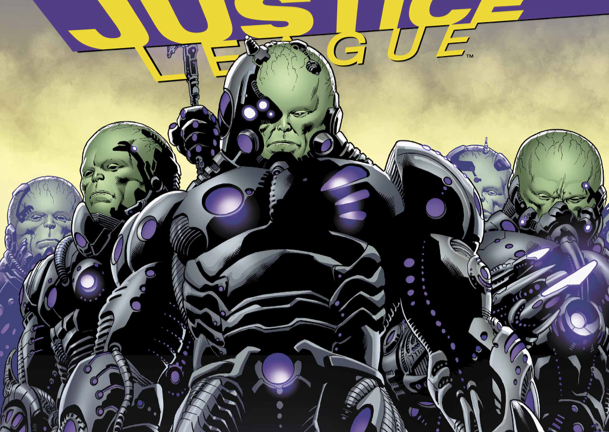 Justice League fans will love the size and scope of this story. The time travel gobbledygook is beginning to grow tiresome as a lack of answers and lots of teasing continue. You can’t fault the awesome art and premise though!